To consume Iberico ham, one should be aware of certain important factors that help determine its flavor, aroma and texture. Temperature is probably the most important of them. Most experts are in agreement that the right temperature to consume Iberico ham is between 21° C and 23° C, because at this temperature the intramuscular fat acquires the texture, color and juiciness that is ideal for consumption. This intramuscular fat is present in the middle of a thinly sliced piece that will allow you to enjoy it's flavor to the maximum. Iberico ham is considered a healthier food, due to its high oleic acid content: oleic acid's positive effects on cholesterol have been shown in numerous scientific studies. Also, Iberico ham has a large amount of the vitamin E and B groups and high quality protein. In addition, the high levels of minerals such as iron and zinc allow you to cover nearly half of the nutritional daily needs of these minerals that are important in the prevention of diseases such as anemia. The consumption of Iberico ham is healthy as longest a balanced diet is maintained. But be careful! Only ham that comes from pigs that been fattened by a pastured feeding, in example pigs fed exclusively with acorns and other resources of the dehesa, have these nutritional properties. In regards to presentation, the Iberico ham is usually served sliced and placed as harmoniously as possible in a dish or tray. For example, when making circles with the slices. 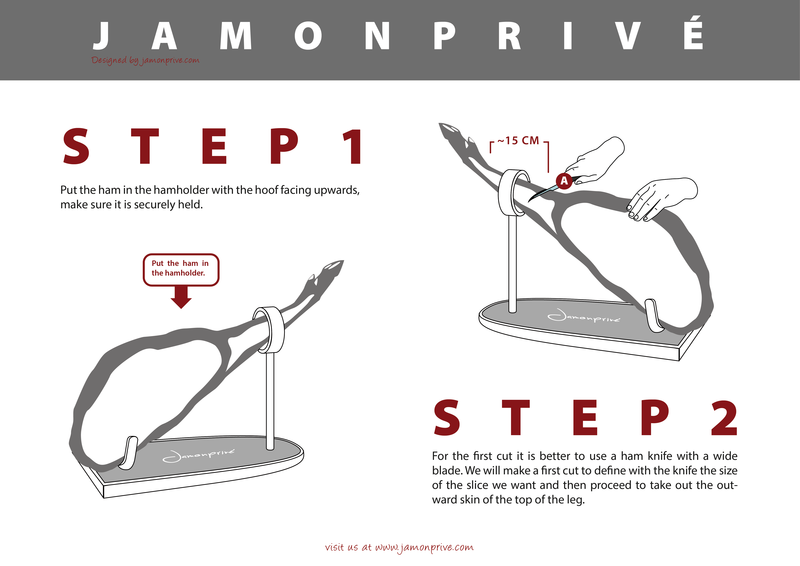 It is recommended not piled up the slices so as to prevent them from sticking together. In general, Iberico ham is usually accompanied by slices of bread, and sometimes eaten with oil. In some places, such as in Cataluña, a traditional bread made with tomato and oil is prepared, which is a great addition to Iberico ham. It is important to consider pairing fine wines with the Iberico hams. The experts in this art, recommend the consumption of Iberico ham with wines such as manzanilla. It has become quite popular to pair with champagne or cava due to its mutual empowerment. Reserve wines of high quality are also very appropriate, as well as young wines with little body and some dry white wines. 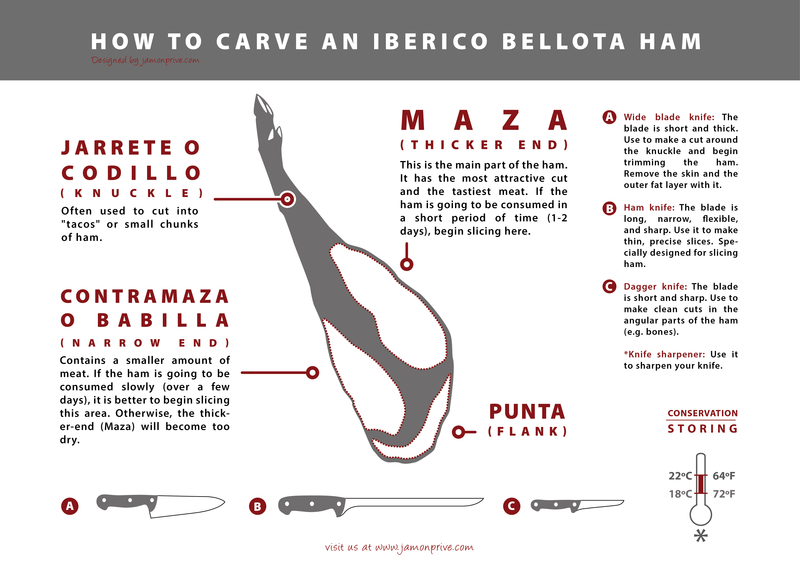 There are also other ways to consume Iberico ham. All recipes containing Iberico ham are highly recommend as many of them are fast and easy to prepare. A good example of such, is the traditional melon with Iberico ham. Although there are other recipes that are more or less elaborate, the flavor of Iberico ham can be enhanced and intensified by the presence of Iberico delicacies.